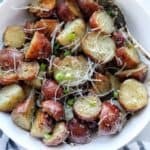 Crock Pot Potatoes make a delicious & simple side dish for dinner and are great for entertaining. Slow cooker potatoes are cooked with olive oil, butter, and spices and cook up to be tender and browned. Slice potatoes and place them into the bottom of the crockpot. Season with spices and add butter. Stir. Cook on low for 4-6 hours or high for 2-4 hours. Add parmesan and chives after potatoes are cooked or add your favorite potato toppings.